We’ve all heard it before – veterinarians urge us to bring our pets in for a checkup once or twice a year, even if they’re in apparently perfect health. This may seem puzzling to some of us. Why should we bring our pets to the veterinarian and pay for a visit if we think our pets are looking and feeling fine? It’s actually really important to have your pet examined, blood work and all, at least once a year. Why? Think about it: as humans age, checkups become more and more important in order to monitor for conditions that become more common with aging. The same goes for your pet. What’s more, even though your pet may appear healthy, he or she might be sick without you even knowing about it. Pets can’t talk (obviously), so they can’t tell you how they’re feeling. Through instinct, they are also very good a compensating and hiding detectable signs or symptoms of disease from us. Did you know that every year for a dog or a cat is equivalent to several years for a person when it comes to aging? It’s true – take a look at our dog and cat age charts to see how old your pet is. In younger pets, it’s important to get that first veterinary visit under your belt. With a new puppy or kitten, your veterinarian will perform an initial physical exam to look for any signs of illness or disorder, and will perform a variety of other tests to make sure your new pet starts off on the right foot. The pre-anesthetic blood work your veterinarian recommends for your pet before a routine spay or neuter is often the first opportunity to establish baseline laboratory values. It’s important to establish baseline laboratory values – in other words, to determine what’s normal for your pet – so that your veterinarian, in future visits, can detect subtle changes from these established baselines which may be the first indication of developing disease. 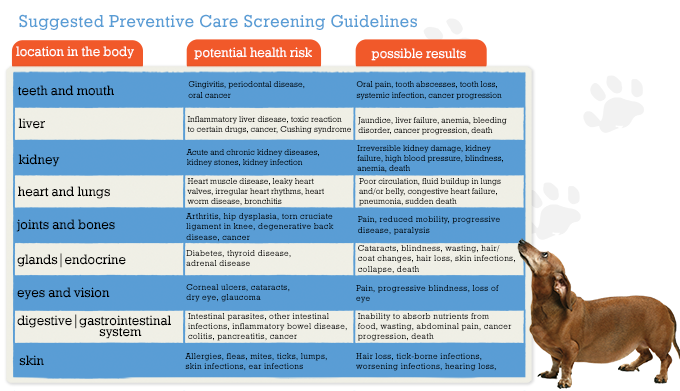 Early disease detection and prevention is paramount to improve the quality and length of our pets lives. During that first visit, your pet will also be given appropriate vaccines. Be sure to read our New Kitten Checklist and New Puppy Checklist to learn more. And it’s important that younger pets, even those that appear to be in perfect health, have yearly exams.